Saint Paul Catholic School (SPCS) is located in New Bern, North Carolina, home of NC's first Catholic Church. Initially, the school was opened just after the Civil War for white children, and operated for just a few years. Then in 1887, Fr. Thomas Price opened St. Joseph Parish and School for African-American families and their children. Fr. Price sought to provide much needed "education skills that had been so long denied the recently freed black men, women, and children..." and the school flourished with its average enrollment of 150 students. By 1926, three Sisters, servants of the Immaculate Heart of Mary (IHM) came to New Bern to offer aid at Saint Joseph School. The success at St. Joseph Catholic School inspired the parishioners at St. Paul to reconsider offering Catholic education to New Bern's white children. 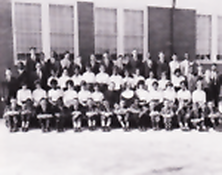 In 1929, St. Paul Catholic School started with 53 white students. In 1943, Father Julian Endler, the Immaculate Heart of Mary (IHM) Sisters, parishioners, and students of St. Joseph experienced a great loss when a fire destroyed the parish and school buildings. Fr. Endler's commitment to continuing to offer a Catholic education to African-American children in the area drove him to rebuild the parish and school and to add a high school in 1945. St. Joseph remained in existence until 1962 when it merged with St. Paul. The building that once housed only black students was renovated and later renamed William Gaston Catholic High School. This high school was the first integrated high school in North Carolina and also served students from neighboring counties. The union of races was a visible sign of Christ's love and acceptance of all His children. In the 1980s, Monsignor James Jones took great initiative and began three major construction projects on the same campus: a new church to replace the tiny, original building from 1840, a convent, and by 1991, a school named Saint Paul Education Center (SPEC). In 2010 the school was renamed Saint Paul Catholic School (SPCS). Today, Saint Paul Catholic School educates Pre-K3 through 8th graders in one building and is just steps away from the church and convent. The school population represents a wide variety of races and ethnicities with Catholic and non-Catholic students. They learn, play, and pray together daily, participate in weekly Mass, and support the community through service projects and community outreach ministries. SPCS is growing faith-filled leaders of the future.